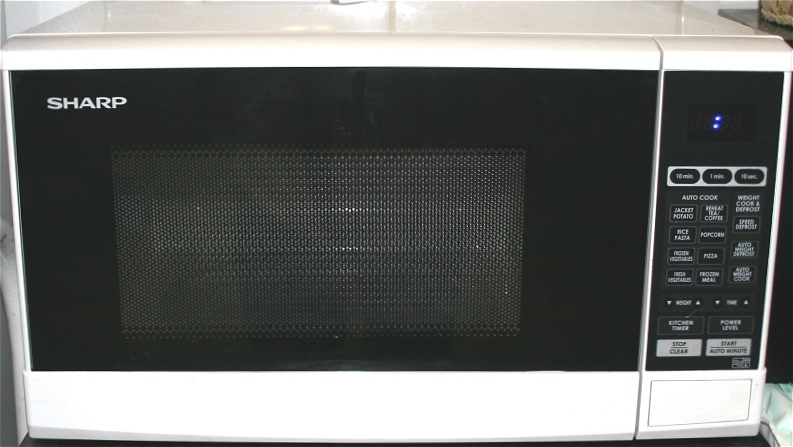 Recently we purchased a Sharp R270WM Microwave Oven from an online retailer having spent ages going through the options of various litre sizes and solo or combination types. 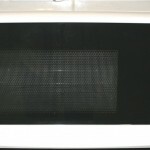 Having previously owned a microwave for around 15 years which had no problems at all (and it was a cheapo one), I was disappointed when it finally went. Why? Because I know that these days most products you buy are built to fail so that you have to spend more money on replacing them faster so I knew I had an uphill struggle. My choice was based around price and brand name – I like Sharp appliances, I always have, and have used stereos and video recorders from them in the past. Here is an image of the 20 Litre R270WM we bought, in situ in the kitchen. Now as I say, my choice wasn’t really based around functionality, although this thing is PACKED with different cooking methods I have to say – but I won’t ever use anything beyond a quick defrost and a standard 800W full power heating cycle for ready meals and rice. Typical stuff really. I do wish I had looked closer at the product though – its dimensions are rather on the short side, with a height which only just allows for an Uncle Bens packet of microwaveable rice to stand up with the top cut off – infact the missus cut one too tall last week and it rubbed on the top of the oven until it finally somehow managed to unbalance itself and fall over. Her fault really as she should have noticed – but it is on the low side. It looks great though in sharp black and white with a very smart looking control panel with quick operation buttons to help get the perfect cook depending on what you are preparing. Here it is below. On the panel are a number of useful – if lesser used – features including cooking jacket potato, heating up drinks which have cooled down (or preparing one from scratch), a setting for rice and pasta along with frozen vegetables and fresh vegetables. Pizza and frozen meals will come in handy and perhaps uniquely there is also a pre-programmed selection available for doing popcorn! Timings are also included as par for the course, with a 10 minute, 1 minute and 10 second breakdown option to allow for accurate and more specific microwaving times. Power is adjustable and there is also a kitchen timer – like an egg timer that sort of thing. Oddly enough – and you may have noticed this in the image above – but the Sharp R270WM does NOT come with a clock. How strange I hear you cry! But it’s true – there is no clock on the panel which permanently shows the time of day or night – a feature which I have become accustomed to over the years on a variety of appliances. Now this would definitely not have been a deal breaker for me if I had noticed it on the sales material, and retrospectively looking back at the old microwave (which had a clock) I never actually observed it anyway – my eyes always tracked towards the wall mounted analogue clock. Incidentally aswell, don’t be overly alarmed because the countdown timings entered cooking times are displayed, so you always know how far into the preparation you are at a glance. Lets take a look at the cooking plate and turntable now. As you can see, whilst the height of the compartment is a little on the low side, the width and depth are more than ample for your standard microwave cookware aswell as cups and normal sized plates of the right material. I feel the wheels on which the rotating plate sits and the three armed rotator is a bit on the flimsy side, and the plate itself is easily dragged off its alignment tracks if you are wearing oven gloves to remove the food and you happen to catch them on it on the way out. 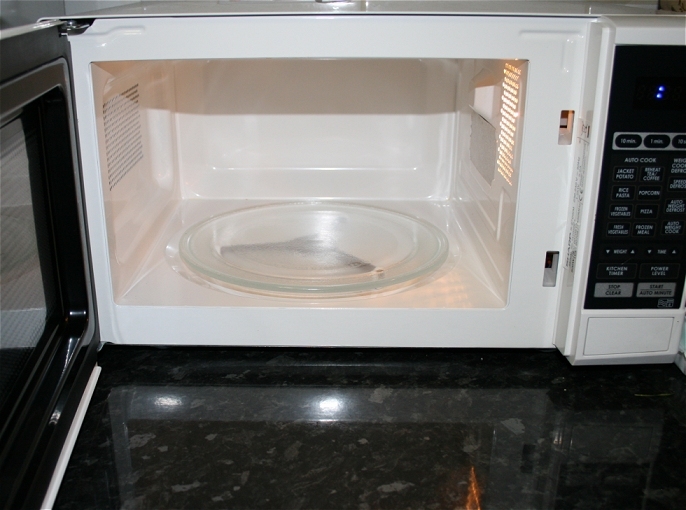 In other areas it can be said that the microwave is somewhat noisy whilst in operation, a bit “non solid” / clangy if you know what I mean when you shut the door and it catches, but apart from that it does the job perfectly adequately. In particular I am really impressed with the frozen jacket spuds I get – perfect. Now there’s something I do want to take note of about this item in particular due to other reviews I have seen. There have been different customers saying that it isn’t too good on the longevity front. Some people say that the inside of the oven degrades in terms of the coatings whilst others have complained that the unit only lasted a couple of months – even though it was not being heavily used. Both of these could be indicative of bad luck or a bad unit – however I am going to be keeping my eye on this product as it wasn’t the cheapest I could find and from a brand as popular as Sharp I would expect fairly high standards to say the least, so I will update this page in a few months time and review how it performs.